I have spent a lot of time lately contemplating the Hebrew language-even more than usual. I simply cannot escape the conclusion that the language is supernaturally composed. 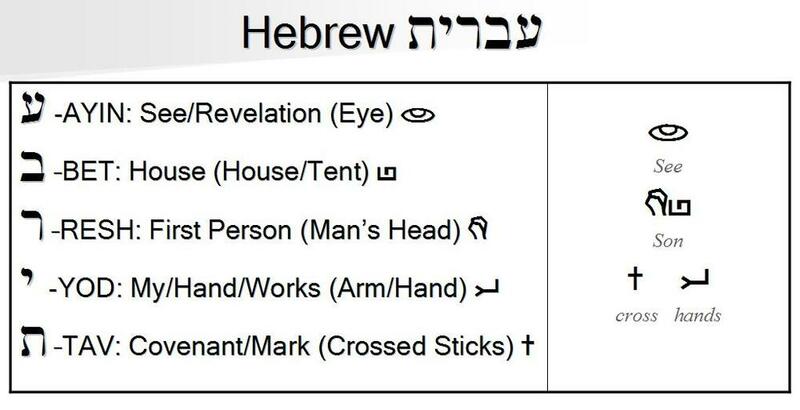 It almost makes me wish I was a statistician so that I could calculate the odds of a human or group of humans developing a pictographic language such as that of the Hebrews. The word "Hebrew," or Ibrit (pronounced ee'vreet, please forgive my phonetic spelling), is derived from the word Ibri (pronounced ee'vree, which is also "Hebrew" in English). Ibri means to pass over or sojourn. Abraham was first called the Hebrew (Ibri) in Genesis 14:13 because he was a sojourner in the land, or he was one who "passed over" the land. It's certainly no coincidence that one of the chief Jewish holidays is Passover, perhaps just a great foreshadowing. In many ways, all believers are called to be "Hebrews," sojourners in this world. So, what of this word, "Hebrew," that would ultimately become the name of the language spoken by the descendants of Abraham? Ibrit is spelled using the Hebrew letters AYIN, depicted in the ancient Hebrew pictographs as an eye and meaning to see, as by revelation; BET, pictured as a house or tent and meaning a house or lineage; RESH, pictured as a man's head, meaning the first or highest person; YOD, pictured as a hand or arm from the elbow to the fist, meaning my or my hand/works; and TAV, pictured as two crossed sticks and meaning a mark or covenant. Before I get to the breakdown of the individual letters that make up Ibrit, I want to point out that brit is the Hebrew word for covenant. Thus, Ibrit can be fairly seen as TO SEE or a REVELATION of the COVENANT. The conclusion that I have reached is that we will SEE, or the REVELATION of, God's COVENANT will be in and within HEBREW. Both within the word "Hebrew" itself and generally though the Hebrew language.